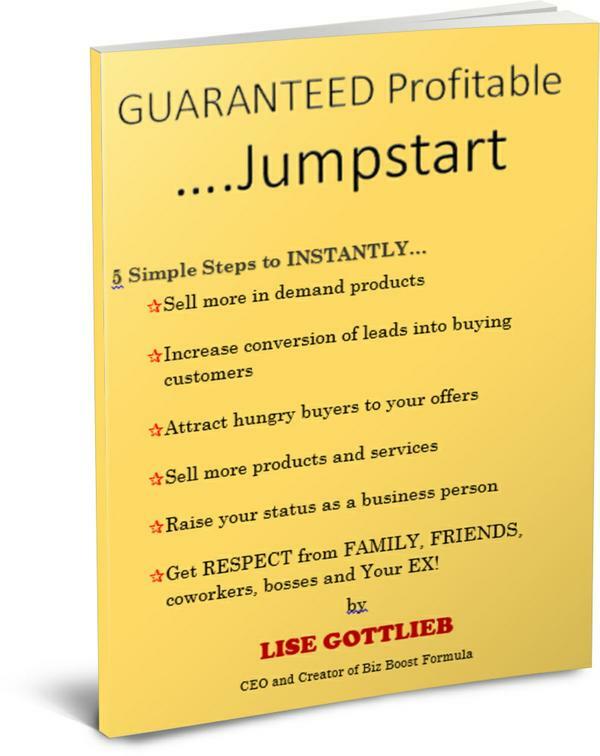 Get my FREE Jumpstart Guide to Guaranteed Profitable in 5 EASY Steps, NOW..
LISE GOTTLIEB, “The e-Commerce Queen of Denmark,” creator of “Power e-com Formula” and “Biz Boost Formula”. In her work as a Sales – and Marketing Expert, Serial Entrepreneur, Harvard Speaker, #1 International Bestselling Author and Award Winning Business Coach, Lise Gottlieb shares her proven strategies with self-motivated, disciplined, hard-working people to help them attain a wholistic life-style that includes personal & financial independence. Lise Gottlieb has quickly become an in-demand International Business Coach. triple and quadruple their profits using tried and tested sales and marketing strategies, such as direct response advertising methods online, lead generation, sales conversion, sales funnels, retention programs, product bundles, social media marketing, Facebook advertising, video marketing, webdesign, SEO and brandbuilding. One of Lise’s biggest passions is coaching and mentoring her clients from around the globe. How To Make Some Quick Cash For The Holidays Like Kim Kardashian? What the Heck is a Sales Funnel, Anyway? How to Start, Grow and Scale ANY Business!